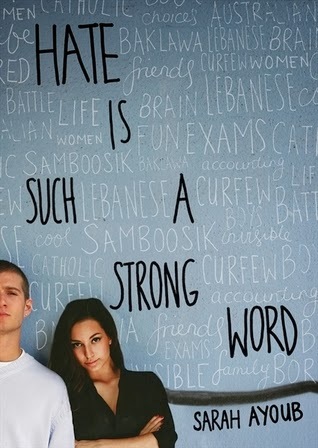 This week I read and thoroughly enjoyed Hate is Such a Strong Word by Sarah Ayoub. This is a debut YA novel that looks the experiences of a second generation Australian whose Lebanese parents have very set ideas of how a young lady should behave. It is an excellent book, a fact I hope to show if/when I write a review of it! In the meantime, if you want to know more head over to Bree's blog as it was her review that convinced me to give this book a go! Today I wanted to share a passage from the book where the author name drops another book, one that I have happened to have read. It is not the only time it happens in the book. One of the other books mentioned is one of my absolute favourites, The Bronze Horseman by Paullina Simons, although I have to admit I was a bit surprised that it was one of the male characters that was reading it. However, the passage resonates for more than just the book name dropping. Is there anything better than having your library buy a brand new book that you have requested and you get to be the first person to read it? How mind blowing to have a librarian purchase a book specifically with you in mind! The quote comes from pages 123-125. Across the quad, Shehadie is reading a book under the pergola, like he's done every day since he came to CSC. Zayden and a few other boys from our class are playing football, and as usual they don't ask him to join in. Instead, they ignore him, or occasionally throw a snide remark his way. My eyes meet Shehadie's and he smiles. I smile back awkwardly, and look from him to Vanessa's group, like we're all part of some confusing game. I start to walk over to him, but my fear gets the better of me and I go into the toilets instead. I sit in a cubicle, take out my journal and doodle over some of the pages. After five minutes, I'm over being pathetic and make my way to the library. Mrs Morton, the librarian, sings out my name as I walk in." "Back again today?" she says. "Don't worry, we'd rather have thirty of you than half the other kids in here." She gestures to the noisy juniors milling about. "Plus, I bet we're good for you too. You must be making headway on all your assessments." "Something like that," I say. "Got anything new for me?" "Actually, I ordered something that I think you'll really love," she says. "If you mind the sign-in book for a moment I'll go find it. Mrs Richards is at the canteen stocking up on chocolate for her 2pm craving so I'm on my own right now." She returns holding a novel for me and my face lights up. There are definite perks to having a good relationship with the librarian. "Diane Armstrong's Empire Day," she says. "As soon as I read the blurb I knew it would be perfect for you. It's set in Sydney in 1948 and looks at some of the issues around post war migration. It'll be useful for your Society and Culture assessment, but I thought the themes - identity, ethnicity, belonging - would interest you anyway." "Wow, Mrs Morton, am I that transparent?" She smiles. "Let's just say that your borrowing record says a lot about your interests. Now, it's not officially on the system yet, so please take care of it and bring it back as soon as you're done." "I always do," I say, grinning. "Thanks heaps. I appreciate it." And just like that, I have even more of an excuse to spend the rest of the week in the library. Books, unlike people, never let me down. Wow, I especially like that last line: "Books, unlike people, never let me down." I'll have to see if my library has this book, since you recommend it. Bonnie, that line is the main reason why I chose to share this whole passage! I can't help it, Marg, I have to come in here and say that this excerpt is exactly why parents must campaign for the restoration of the school library in primary schools! So many are just a room with books now, and no librarian staffing it, just a library technician and it's the class teacher's job to take the class to library to borrow a book. But not every class teacher is a reader (it's hard to believe but it's true) and they cannot possibly know much about what's stocked in that library, never mind be in a position to buy new books to suit personal tastes. Primary school librarians are crucial to turning kids into readers - research proves their impact on literacy results - yet they're an endangered species! This year I have finally cracked one of my hardest nuts. A boy with a veneer of 'cool' arrogance, youngest in his family, condescending about reading, but with a mature sense of humour and an intelligence not yet expressed in anything much. Obsessed with computer games, of course. Well, last year I got hold of the Gamer's Trilogy by George Ivanoff, gave it to him brand new and never read by anyone else - and *because I had read it too* was able to chat about it with him as he read it. He read the whole trilogy, and now because he trusts me and my judgement he's in the library every week looking for a new book. If I can keep up the momentum, this boy will keep on reading, widen his tastes and expand his virtuosity from just talking about books to drawing on them in other subjects. This is what librarians do! I am glad that you did stop by Lisa! And yes, you are right, the value of having someone who knows and loves books to impart that to all readers, but especially reluctant readers, is essential!